Big, loud, dumb and cheesy. 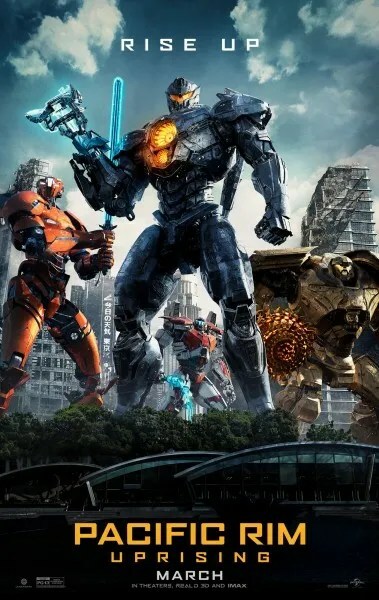 About what you would expect from a movie featuring giant robots fighting giant monsters. I was not a fan of the first Pacific Rim film. I found it to be dull and lacking any real story, which I think most people would agree with. So I was not really looking forward to the sequel to the film, and, while I was not that bored during the film, there is no doubt that the non-robot/monsters part of the story left a ton to be desired. The film tried to make up for that lack of script by casting John Boyega as the lead role of Jake Pentacost, the son of Idris Elba’s character in the original movie. Boyega, much like Elba, is a strong actor with a ton of charisma that can help overcome a script that may not have what it needs. A lesser actor would have failed miserably. Boyega carried much of the story, at least what there was. The action of the film was pretty solid, definitely better than the Transformers movies. You could see what was happening most of the times here. However, there was a significant lack of Kaiju presence in most of this film and if you were anticipating a lot of Jaeger vs. Kaiju action throughout the film, you may be disappointed. There is several Jaeger on Jaeger action though. Jake had left the Jaeger program because of troubles and he comes across a Jaeger thief/inventor in 15-year old Amara (Cailee Spaeny) who was ripping off Jaeger junkyards for spare parts. Then, they are both captured by the Jaeger people and forced to join the Jaeger training program. Jake returns to his old stomping grounds with the same swagger as before. That’s basically it. There is a sub plot with drone robots looking to replace the two-man tandems that run the Jaegers, and that leads to the worst plot twist of the film featuring Charlie Day’s character of Newt from the first film. Of course, everything that you thought might happen in the film happens just as you think it would. Having said that, the third act fight sequence with the actual Kaiju was decent and the special effects are fine. The group of young pilots that Amara joins at first are the least developed, singularly unimpressive group brought together in a long time. There was the blonde Russian (I think) who was supposed to be the mean one toward Amara. There was the guy who had his shirt off showing off abs and a waistline that had to be CGI because no human being could look like that. There was the other guy… um… who SPOILERS is there to die. I think there were more, but they were less memorable that this crew. Steven DeKnight directed this sequel, and he does a decent job. As I said, the action looked pretty good and was the best part of the film. It just needs more of a script. I did not hate this movie, but there are so many things that could make it better.